The Penny Black was the world's first adhesive postage stamp used in a public postal system. It first was issued in Great Britain on 1 May 1840, for official use from 6 May of that year. It features a profile of Queen Victoria. In 1837, British postal rates were high, complex and anomalous. To simplify matters, Sir Rowland Hill proposed an adhesive stamp to indicate pre-payment of postage. At the time it was normal for the recipient to pay postage on delivery, charged by the sheet and on distance traveled. By contrast, the Penny Black allowed letters of up to half an ounce (14g) to be delivered at a flat rate of one penny, regardless of distance. Postal delivery systems using what may have been adhesive stamps existed before the Penny Black. The idea had at least been suggested earlier in the Austrian Empire, Sweden, and possibly Greece. On 13 February 1837, Sir Rowland Hill proposed to a government enquiry both the idea of a pre-paid stamp and a pre-paid envelope, a separate sheet folded to form an enclosure for carrying letters. Hill was given a two-year contract to run the new system, and together with Henry Cole he announced a competition to design the new stamps. There were some 2,600 entries, but none was considered suitable; instead a rough design endorsed by Hill was chosen, featuring an easily recognisable profile of the former Princess Victoria. Hill believed this would be difficult to forge. An envelope bearing a reproduction of a design created by the artist William Mulready was also issued. The portrait of Victoria was engraved by Charles Heath and his son Frederick, based on a sketch provided by Henry Corbould. Corbould's sketch was in turn based on the 1834 cameo-like head by William Wyon, which was used on a medal to commemorate the Queen's visit to the City of London in 1837. This portrait of Victoria remained on British stamps until her death in 1901, although by then she was 81 years old. All British stamps still bear a portrait or silhouette of the monarch somewhere on the design. They are the only postage stamps in the world that do not indicate a country of origin; the monarch's image symbolises the United Kingdom. Initially, Hill specified that the stamps should be 3/4 inch square, but altered the dimensions to 3/4 inch wide by 7/8 inch tall (approx 19 x 22 mm) to accommodate the writing at the bottom. The word "POSTAGE" at the top of the design distinguishes it from a revenue stamp, which had long been used in the UK; "ONE PENNY." at the bottom shows the amount pre-paid for postage of the stamped letter. The background to the portrait consists of finely engraved engine turnings. The two upper corners hold Maltese crosses with radiant solar discs at their centres; the lower corner letters show the position of the stamp in the printed sheet, from "A A" at top left to "T L" at bottom right. The sheets, printed by Perkins Bacon, consisted of 240 stamps in 20 rows of 12 columns. One full sheet cost 240 pence or one pound; one row of 12 stamps cost a shilling. As the name suggests, the stamp was printed in black ink. A two penny stamp printed in blue and covering the double-letter rate (up to an ounce) was issued on 8 May 1840. Although the stamps were not officially issued for sale until 6 May 1840, some offices such as those in Bath sold the stamps unofficially before that date. There are covers postmarked 2 May, and a single example is known on cover dated 1 May 1840. All London post offices received official supplies of the new stamps but other offices throughout the United Kingdom did not, continuing to accept payments for postage in cash for a period. The Penny Black lasted less than a year. A red cancellation was hard to see on the black design and the red ink was easy to remove; both made it possible to re-use cancelled stamps. In February 1841, the Treasury switched to the Penny Red and began using black ink for cancellations instead, which was more effective and harder to remove. However, people still reused stamps by combining the uncancelled parts of two stamps to form an unused whole, so in 1864 as a further safeguard the top corner stars on the Penny Red were replaced by the lower corner check letters in reverse order. Imprimaturs sheets are from among the first sheets of stamps printed from a finished printing plate. The actual imprimatur (Let it be printed) refers to the written permission of the Inland Revenue officials entered on the back of the sheet of stamps. In the 19th century, it was common for officials to remove some stamps from each sheet to present as gifts to dignitaries and other important people. 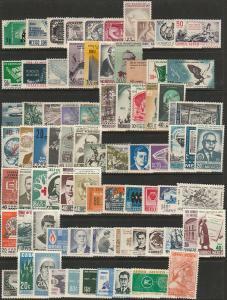 Individual stamps from an Imprimatur sheet can thus be found for sale on the open market. A complete sheet of the Penny Black without check letters is held by the British Postal Museum. This unique item is in fact a plate proof, and by definition not an imprimatur sheet. 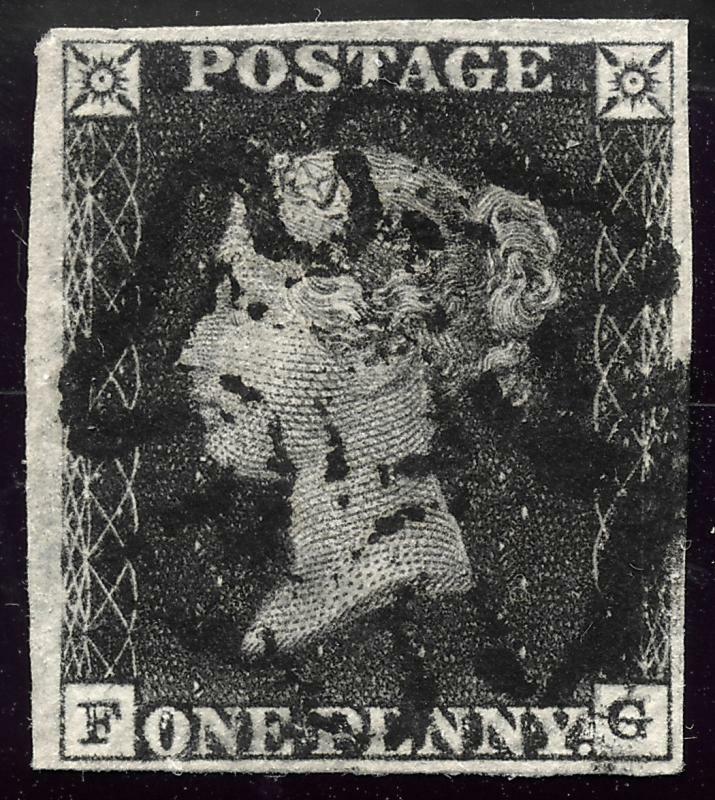 The Penny Black was printed from 11 plates, but as Plate 1 was completely overhauled due to excessive wear, it is generally considered to be two separate plates, 1a and 1b. Plate 11 was originally intended solely for the printing of new red stamps, but a small number were printed in black. These are scarce. 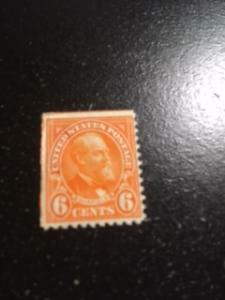 The stamps were printed in unperforated sheets, to be cut with scissors for sale and use. An original printing press for the Penny Black, the "D" cylinder press invented by Jacob Perkins and patented in 1819, is on display at the British Library in London. The total print run was 286,700 sheets, containing a total of 68,808,000 stamps. 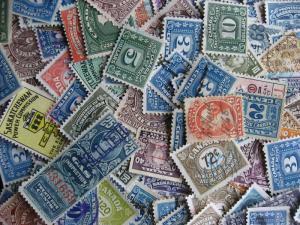 Many were saved, and in used condition they remain readily available to stamp collectors. The only known complete sheets of the Penny Black are owned by the British Postal Museum.